Platycerium bifurcatum, commonly known as the staghorn fern or elkhorn fern, is a modestly cold hardy subtropical epiphyte native to eastern Australia and parts of the the East Indies. Though no species of the genus Platycerium can be called truly cold hardy, this species is capable of handling temperatures down to 27 F (-3 C) with minimal damage. This article chronicles a plant I’ve grown in my yard in southern Japan for the last 11 years – a climate that has tested the boundary of its cold resistance many times. P. bifurcatum is without a doubt the most commonly propagated member of this relatively small genus of epiphytic ferns (~18 known species). Like many ferns, these grow two types of fronds, fertile and infertile. The fertile fronds are elongate, leaf-like and bear spores, while the infertile fronds (also called shield fronds because of their flat, spreading habit) have no spores. In P. bifurcatum the fertile fronds are forked (bifurcate), looking like a deer’s antlers. The shield fronds grow more or less flat against whatever they are mounted on, and are roughly circular in shape. In time plants can form formidable clumps, spreading by “pups”, or offshoots that grow off small stems (called rhizomes), just below the shield fronds. Large clumps can grow to nearly the size of a small car! Platycerium bifurcatum growing my garden in southern Japan, on the island of Kyushu. 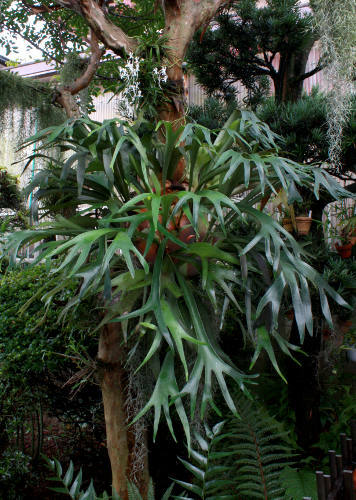 P. bifurcatum is the most commonly available cold hardy staghorn fern. 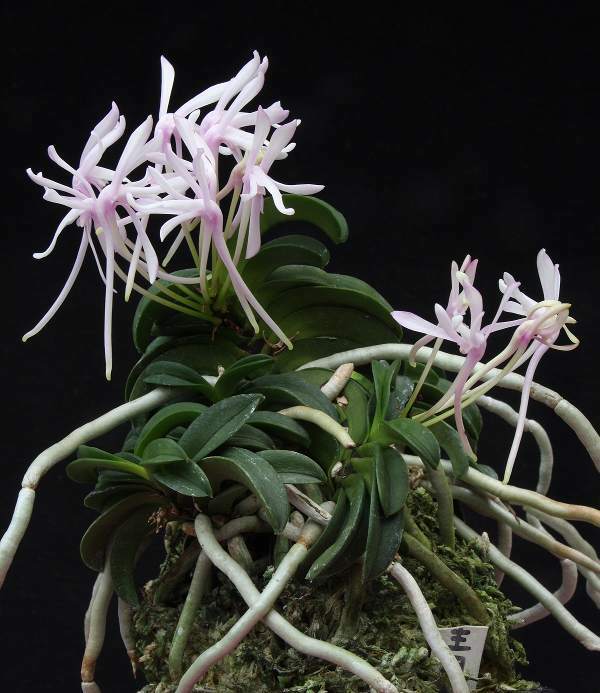 Only one other species is perhaps even more cold hardy, that being P. veitchii, which is said to handle 25 F (-4 C) without suffering. P. bifurcatum is reliably cold hardy down to 27 F provided that any given frost event is not terribly long, and the following summer is long and warm enough to allow it to recover fully. It can even take down to 24 F (-4.5 C), but events like this must be very sporadic, or the plant will not be able to recover. I moved to my current house in the fall of 2004. It is situated on the edge of some moderately tall mountains (up to 3000 ft, or 900 m elevation), and is approximately 3 miles (~5 km) from the sea. The region rarely sees below 27 F, but can get down to 23 F (-5 C) on occasion. Winters are relatively short, starting in earnest by mid to late December, and finishing by late February. During this time frosts are frequent, but usually last no more than a day. Average temperatures during this period normally are 43-45 F (6-7 C) overall, with highs around 48 F (9 C) and lows just above freezing. Winter rain is frequent, but usually light to moderate. Snow is also common, but short lived, normally melting within a few hours of accumulating. By contrast, both spring and fall are long and mild. The frost free months extend from early April through late November or early December. Spring is followed by a strong summer monsoon, lasting from early June to late July. Temperatures during this period are warm, averaging around 77 F (25 C), and most days are cloudy with at least some rain. From late July through mid September is the real heat, with daily highs averaging between 90-93 F (32-34 C), and lows only down to 79-83 F (26-28 C). This is a time of true tropical heat. I mention all of this to give a context for describing how P. bifurcatum has performed in my garden over the last decade. Based on my results, you can get an idea of whether your climate will be suitable to try this one outdoors or not. I will add that my plant has received no special winter protection, not even from snow. So lets see how it has progressed through the years, and what setbacks it has also endured. In the summer of 2013 I bought a nice flowering division of the cold hardy Chinese slipper orchid, Paphiopedilum armeniacum. I’d tried this species before, but always started with a rather weak plant, and looking back, they probably were all wild collected. The new plant was healthy, with very strong roots and a flower that lasted a long time – a good sign a plant is happy. 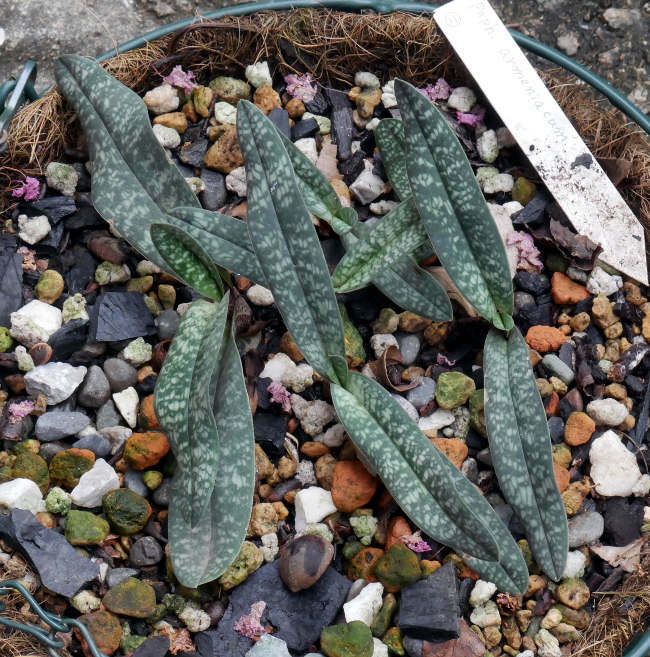 This species is known for growing long stolons between growths, unlike most other Paphiopedilums, making it difficult to keep in a traditional pot for very long. I’d seen masterfully grown plants in big flat trays and hanging baskets, and instantly wanted to try my hand at growing this species that way too. Check out this link to see the grower that inspired me to try this method: Paphiopedilum armeniacum basket culture success story. The first season I let the plant grow in the small pot it came in, but in March of 2014, I planted it into a standard hanging basket with a coconut fiber shell (figure 1). I punctured the dense fibers of the coconut liner to allow water and the stolons of the plant to easy pass through. The growing mix was pretty standard for this species, a mix of large diameter perlite and pumice gravel, fine bark and chunks of charcoal. The plant was kept in a semi-shaded area hanging from a sasanqua bush, Camellia sasanqua, where it received plenty of summer rain and was fertilized regularly. 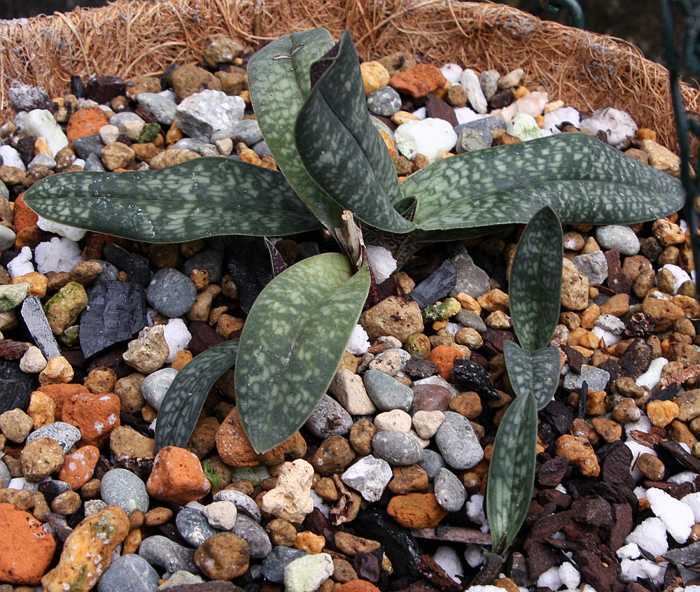 Figure 1: Paphiopedilum armeniacum in March 2014. The plant was taken in during the worst winter weather even though this species is known for enduring repeated frost. In winter watering was held to a bare minimum, but humidity levels were maintained over 50%. By the spring of 2016 the plant had grown steadily, increasing from one main growth and three smaller ones, to three adult growths and two slightly smaller ones (figure 2). Though I was encouraged that it grew fairly well, something seemed not quite right, so I decided to replant it into fresh medium. Figure 2: The same plant two years later. It looks good, but not quite thriving. Growing cycads is a labor of love that takes a lot of patience, and failure is common. That is particularly true if try to grow species from around the world since they have a wide range of needs and tolerances. In my home garden here in southern Japan I grow species from the Americas, Africa, Australia and Asia. My success has been, not surprisingly, variable. I grow all of my collection in pots since my garden is quite small and I rent the house. 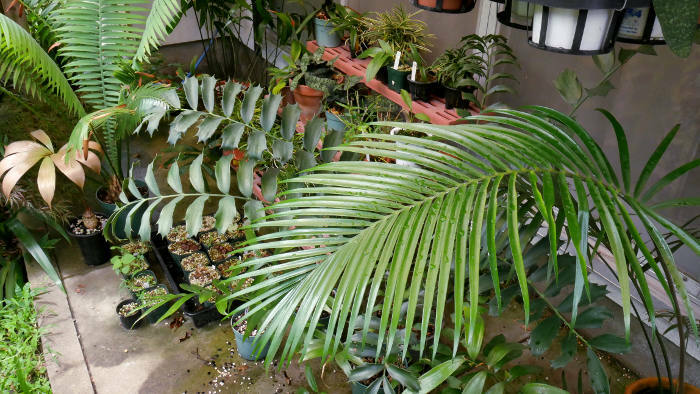 Here’s what’s going on in my cycad collection this summer, 2016. 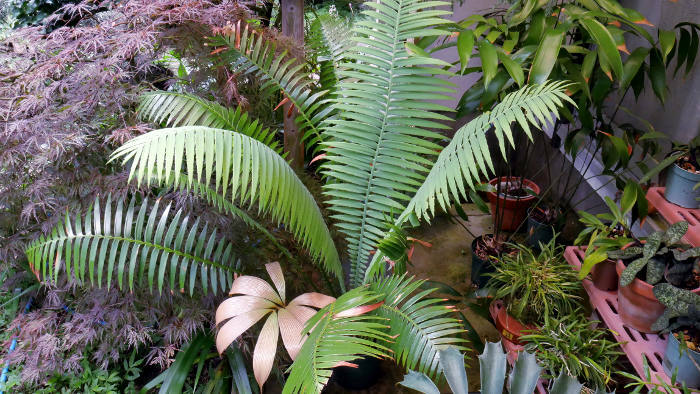 Lepidozamia peroffskyana (right foreground), Encephalartos ferox (center), Dioon spinulosum (left back), and Zamia dressleri (pink flushed plant) – all of these plants have flushed new leaves this season except E. ferox. When growing cycads you get used to plants skipping a season for new frond growth. Dioon spinulosum and Zamia dressleri – both plants have newly flushed growth. The Dioon has a lovely soft blue green color and the Zamia pink-bronze. Both will harden off and mature to dark green. 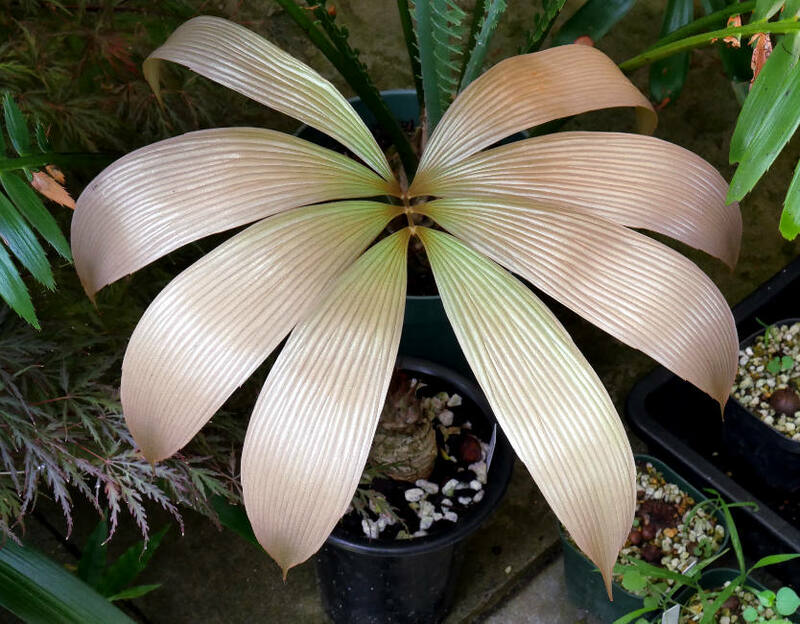 Zamia dressleri – his species has been really hard to keep here in southern Japan, mostly because of the colder winter conditions, even in the relative warmth of a grow room which occasionally goes down to 5 C – not to its liking. It is said this species also needs a particular mycorrhizal fungus to remain healthy long term. I can only guess this plant was inoculated with the fungus when I got it five years ago. The loquat tree, Eriobotrya japonica, is an evergreen broad leaf tree or shrub originally native to south-central China, being most famous for its sweet, succulent fruit. Through the years it has been established in subtropical to southern temperate regions across the world and has naturalized in many places. It’s species epithet, japonica, is in truth a misnomer since it was first encountered by a westerner, the botanist Thunberg, in that country. Regardless, the plant has gained notoriety across the globe as an ornamental tree, for its fruit products, as tea (loquat leaf tea) and to a lesser extent, as a medicinal herb. Eriobotrya japonica is a tree or large shrub of low subtropical mountain forests, attaining a maximum height of about 10 meters. Usually single stemmed, the bark is grey-brown, with smaller branches typically covered in a rusty to grey colored “wool” (a condition known as tomentose). The ripe fruits of the loquat tree are produced in clusters and typically are bright orange. The broad crown is densely branched and rounded in form. The tree’s rigid, evergreen leaves are simple, broad, serrated, and deeply veined, each growing from 10-25 centimeters long. New leaves are fully tomentose and light green. They turn dark green and shiny as they age, but remain tomentose on their undersides when mature. The flowers are borne in loose to tight clusters from late fall into early winter, and are quite aromatic. They are small, no more than 2 centimeters across, with five white petals surrounding a yellow center. The buds as well are tomentose. The flowers are pollinated in the depths of the winter months, and by spring mature into clusters of simple, round and slightly elongated fruits, brilliant orange in color and typically no more than 5 centimeters in length. These as well are have a slight fuzz to the outer skin, but inside are fleshy, juicy and sweet. Loquat seeds, usually numbering 2-4 per fruit (though there can be up to 10), account for much of the fruit’s mass, perhaps up to one third of their total weight. The loquat is originally native to subtropical forests of southeastern Sichuan and adjacent areas of Hubei Province in south-central China. Since ancient times it has been cultivated over much of southern China, Indochina, Taiwan, and Japan. Readily spreading from seed, it naturalized in these same areas centuries ago, effectively becoming part of the native flora. In more recent years it has been naturalized throughout the world in appropriate climates stretching from India to the Middle East, throughout the Mediterranean region, parts of eastern and southern Africa, the southern USA, throughout Central America and into South America (where it grows in the cooler highlands), Australia, New Zealand, and numerous island chains including Hawaii, Bermuda, and Réunion. New growth on loquat trees is light green in color and very fuzzy. This growth also contains high levels of toxins and should never be consumed. This species is considered an invasive weed in eastern Australia (Queensland and New South Wales), throughout the southern USA, New Zealand, South Africa and on many islands throughout the world (for example, Lord Howe Island, Norfolk Island, Easter Island, The Galapagos, Hawaii, Réunion and Tonga). E. japonica probably was first cultivated for its fruit. Like many other fruit trees, typical wild forms do not usually produce desirable fruit, so selective breeding was needed. 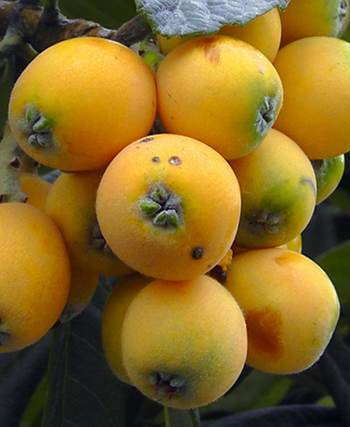 Loquat trees are thought to have been cultivated in China for over a thousand years. 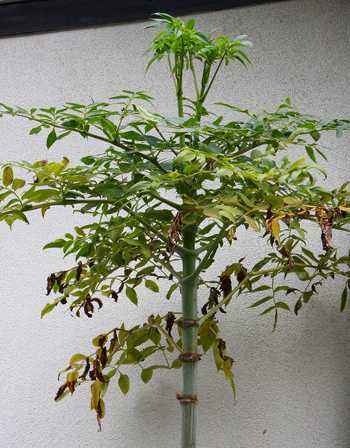 This tree (known as biwa in Japanese) made its appearance as a cultivated plant during the late Edo Period in Japan (1603-1868), though wild forms with undesirable fruit likely had been brought centuries earlier. Loquats were first cultivated in Europe as early as the 1700’s. It is believed that Chinese immigrants brought the tree to the Hawaiian Islands in the late 1700’s. While many gardeners grow dahlias, few even know of the tree dahlia, Dahlia imperialis, the largest of them all. Though it can attain tree size, like other dahlias it is an herbaceous plant that dies down to the ground in cold weather. A native of Central America’s highlands, it nevertheless can be grown in fairly cold winter climates. Beyond the plant’s amazing size, the flowers are the main drawn in the garden, and they couldn’t come at a more novel time – just before the first frosts of winter hit. 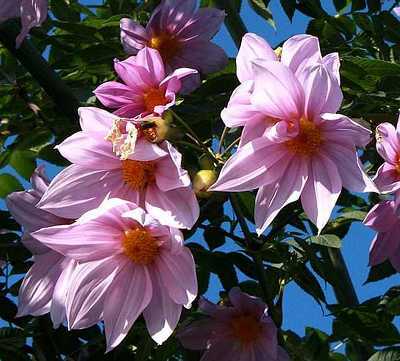 The flowers of the tree dahlia, D. imperialis, are borne in generous clusters just before the frosts of winter hit. D. imperialis is a large herbaceous plant standing typically between 2-6 meters tall, with extra vigorous specimens reported to top out at 9 meters. The fleshy stems grow singly or in clumps, starting out vertical, but eventually bend in a gentle arc by flowering time. They are segmented with nodes around 30 centimeters apart, giving them a superficial bamboo-like appearance. 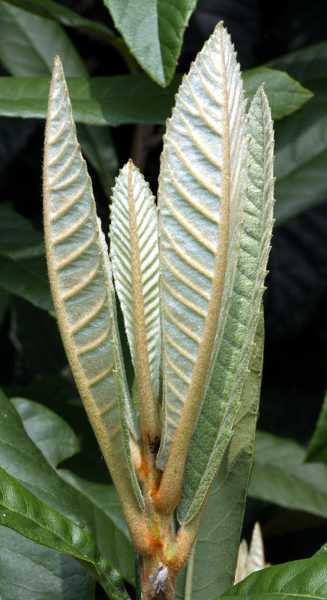 The leaves are compound in structure and are borne in opposing pairs. They look much an elderberry leaf (Sambucus sp. ), with broad leaflets that are rich green in color. Underground thickened stems form clumps of elongate tubers with relatively few wiry roots. The flower heads form rapidly late in the season, with flowering starting in early November. Each growth can hold multiple heads of flowers, bearing 2-20 pale purple flowers 10-15 cm across. Flower color is variable, ranging from mauve (most common) to pale pink and even pure white. The flower center is orange-yellow. Double flower forms also exist, both pure white and pink. The tree dahlia is a plant of relatively high mountains, being found above 1500 meters elevation from Mexico’s central ranges, and southward to Guatemala and Panama (some sources report them from Columbia as well). These are plants of open, sunny environments growing in well drained, yet rich moist soils. In their native range some frost can be expected, hence their adaptation of going dormant in winter. By early September the rapidly growing plant slows down a bit and gets almost bushy – then in October it rockets upward again in preparation for flowering. Growth begins relatively late, even here in southern Japan, usually not before mid May. In cooler maritime climates they may start even later. This is not a problem since they explode into growth during warm, wet weather. I’ve noticed that plants will grow up to around 2-3 meters tall by August and then they seem to slow down, becoming almost bushy at the top end. Then sometime in October they continue their rocket upward, growing another 2 or more meters higher, rapidly forming their flower heads which typically bloom around the second week of November. One issue with this plant is its late flowering period. It seems to flower after most plants have died down and with winter just around the corner. If you live in an area where the first frosts don’t come before December, then flowering will commence normally. If however frosts hit in October or November, you’ll never see your plants flower, even if they grow normally and overwinter well. This seems to be a common complaint with plants being grown in the UK and the eastern USA in cold hardiness zones below zone 8, where early season frosts are common. The genus Zephyranthes (commonly called rain lily, zephyr lily, and fairy lily) is a group of New World bulbs more closely related to Amaryllis than the true lilies, genus Lilium. In nature these plants are native to warm temperate, subtropical, and tropical regions ranging from the southeastern USA through Central America and into South America. Due to their great beauty and vigor, several have become established throughout the warmer climates of the world including parts of Africa, Asia, Australia and even many south Pacific Islands. In this article we’ll be looking at three commonly grown rain lilies: Zephyranthes candida, carinata, and citrina. What makes these a perfect trio is their relative cold hardiness, ease of cultivation, and variation in color – white, pink and yellow, respectively. What’s more, they are so popular that all three are easily obtained from normal garden centers, big box stores, as well as specialty nurseries. Rain lilies grow from tunicate type bulbs and have grass-like leaves. These plants are Zephyranthes carinata. Rain lily bulbs are tunicate type bulbs, similar to Narcissus, Amaryllis, and Lycoris, usually not more than 2-3 centimeters in diameter. They readily form new bulbs by offsets, which are of course genetically identical. Many also easily germinate from seed, thus they can form large, clumping colonies, sometimes carpeting the ground. Their leaves are grass-like and quite short, usually not more than 30 cm long. They are typically evergreen, but during cold snaps they can go fully dormant. Flowers are borne singly, held in an upright position, are relatively large and showy, and have a variety of colors ranging from white to pink and yellow. Petals are uniform, broad, prominently veined, concolor, and six in number. The center of the flower is dominated by six large, elongate anthers, typically yellow to orange in color. Flowers are held just above the leaves on relatively short, fleshy scapes. Flowering ranges from spring through early autumn. Many flower most abundantly after significant rains, hence their common name, rain lily. The following are descriptions of the three above mentioned species, focusing on their distributions (both native and naturalized ranges), habit, and specific information about each. Z. candida – a species originally from southern South America – Argentina, Uruguay, Paraguay, and southern Brazil, having become naturalized over much of the world from the southeastern USA, the West Indies, southern Africa, southern Asia including China, Korea, Japan, as well as Australia (Queensland), and a number of south Pacific Islands. It is perhaps one of the easiest in the genus to keep happy, withstanding both fairly heavy frosts to scorching hot summers. The flowers are pure white (sometimes blushed with pink) with a green center, bright yellow-orange stamens, and are up to 5 centimeters across. The petals are relatively narrow and pointed, giving the flower a star-like quality. The flowers commonly open en mass after heavy rains, giving quite a show. The leaves are rather thick and curled inward, giving the overall impression of a sedge or rush – another interesting feature of this species, and possibly the reason why it is relatively cold hardy. The windmill palm, Trachycarpus fortunei, is the most cold hardy of the arborescent palms found anywhere in the world – at least as far as we know. Originating from central China and adjacent parts of southeast Asia, it is grown in far flung parts of the world these days, withstanding surprising amounts of cold, wintry weather. If you’ve seen a picture of a palm tree with snow covering it, most likely it was a T. fortunei. It has become such a common feature in “tropicalesque” temperate gardens that having one is no longer a big deal nowadays. In nature it lives in humid continental climates that range from cool to hot in summer, and quite frosty in winter. For this reason it can be grown in both hot and cool summer areas, provided winter lows don’t get too cold. Trachycarpus fortunei, the windmill palm, is the most cold hardy of all arborescent palm trees. 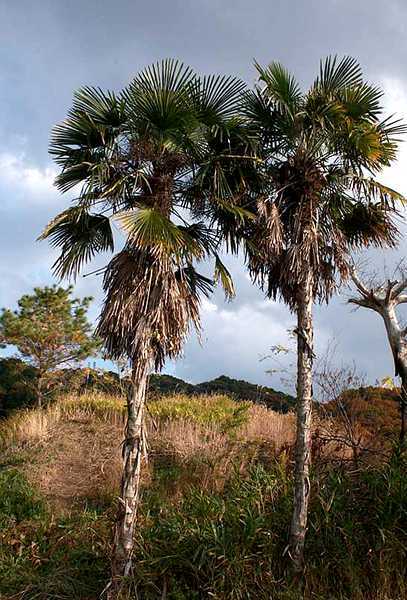 Trachycarpus fortunei is a single stemmed, arborescent palm of relatively cool mountain forests. The trunk typically attains heights up to 10 meters (~30 feet), however vigorous ones can go 13 meters or more (a little over 40 feet). 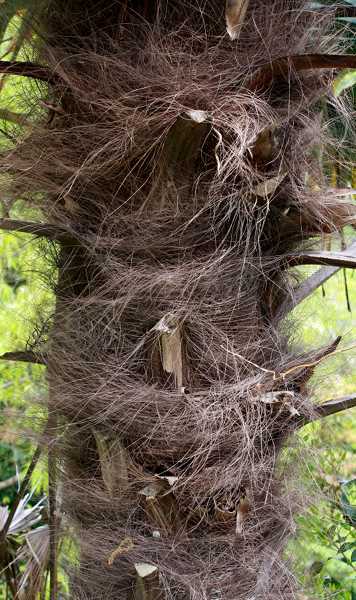 It’s trunk is quite narrow, no more than 30 centimeters in diameter, and usually covered by a thick layer of old leaf bases that look exactly like a fibrous plant husk. Some older trees have clear trunks that are grey in color. The fronds are palmate, meaning they have a long leaf stem (petiole) that ends in a fan-like frond composed of fused leaflets. 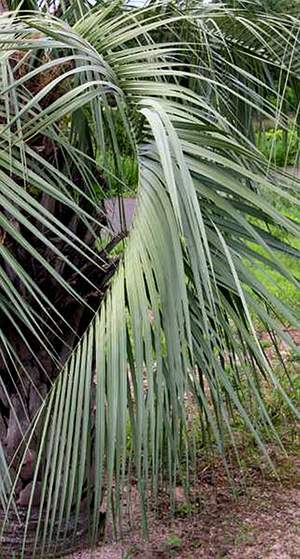 These grow up to 2 meters long, are very regular in appearance, are normally dark green, and very nearly round, hence the common name windmill palm. The petioles are nearly bare except for a two rows of small spines, and can be up to a meter long. The fan is composed of 30 to 50 leaflets, each up to 90 cm long. They can be held straight out in some trees, forming a true fan shape, or droop considerably in others (much like the leaflets of Livistona chinesis). These characteristics are consistent within a tree, and so are due to genetic rather than environmental factors. The trunk of the windmill palm is literally covered by fibrous old leaf bases. These have been used in Asia as a material for fabrics. Flowering commences in mid spring. Clusters of flowers (called spadices) emerge and elongate into downward arcing scapes up to a meter long and carry hundreds of flowers each. 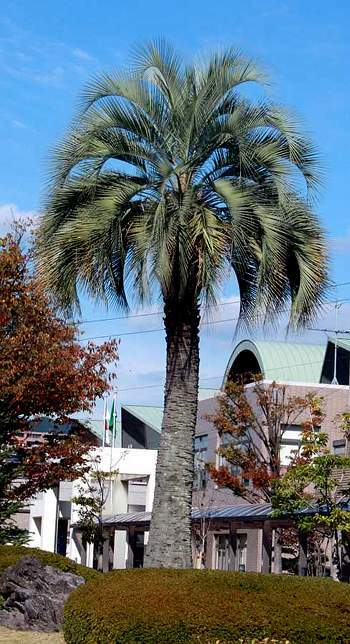 This palm is dioecious, meaning trees either carry female or male flowers. Flower color is creamy yellow, though the female flowers are bit more green. Male trees can also have spadices that have hermaphroditic flowers (having both female and male parts) and these can set viable seed. The kidney shaped seeds mature to a blue-black color by late fall and winter. 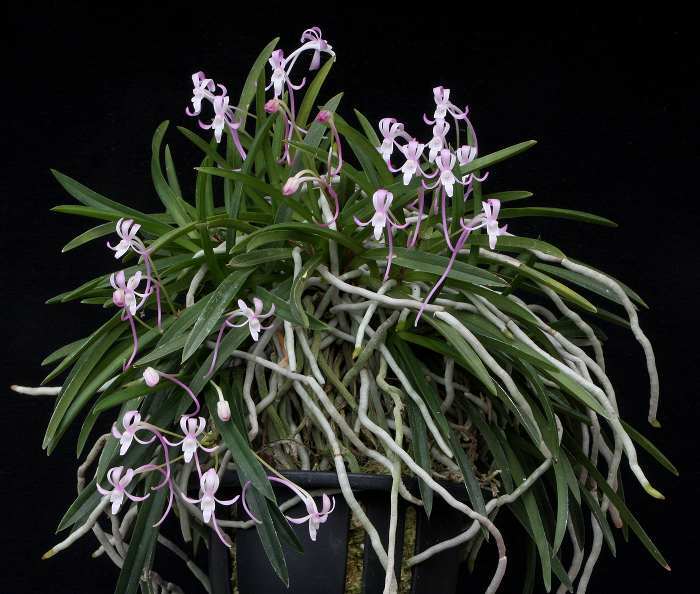 Neofinetia falcata (now considered by most authorities to fall under the genus Vanda), is a small epiphytic orchid hailing from southeastern China, South Korea, and Japan. Throughout its range in Japan it is now considered either critically endangered, endangered, or vulnerable by Japan’s Ministry of the Environment. That includes the area I live, Fukuoka Prefecture, on Kyushu’s northwest coast. What follows is an account of my wife, Yumi, discovering a semi-wild population on the very eves of the largest city in southern Japan, Fukuoka. A little background information first. 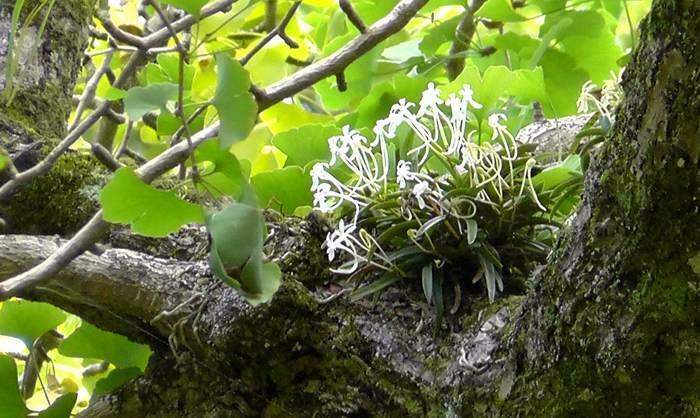 I have hunted the woods around Fukuoka City for over 10 years now and have found out first-hand just how rare most orchid species have become over the centuries. For perspective, realize that Fukuoka itself has a population of nearly 1.5 million people, and the greater metropolitan area has many more – about 5.6 million. It ranks as Japan’s 6th largest city. Impressive. 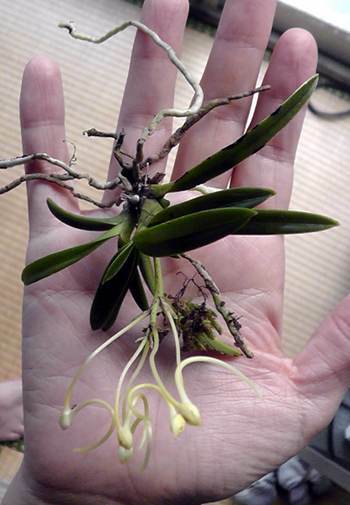 Here is the small budded plant of Neofinetia falcata my wife found under a large ginkgo tree. Such large human populations have a huge impact on the environment. Virtually no lowland native plant communities yet survive, except as remnants on hills scattered here and there in and around urbanized areas and on sea islands that dot the coastline. Virtually all of these are biologically impoverished from centuries of human impact. The remaining land has been in agricultural use for centuries, and the rivers all contained within massive earthen dikes. Urban rivers and smaller streams are as a rule bound by concrete walls. The hills and mountains themselves remain mostly forested, but on average more than 50% of native forest has been replaced by either hinoki (Chamaecyparis obtusa) or sugi (Cryptomeria japonica) plantations – poor habitat for most orchid species. 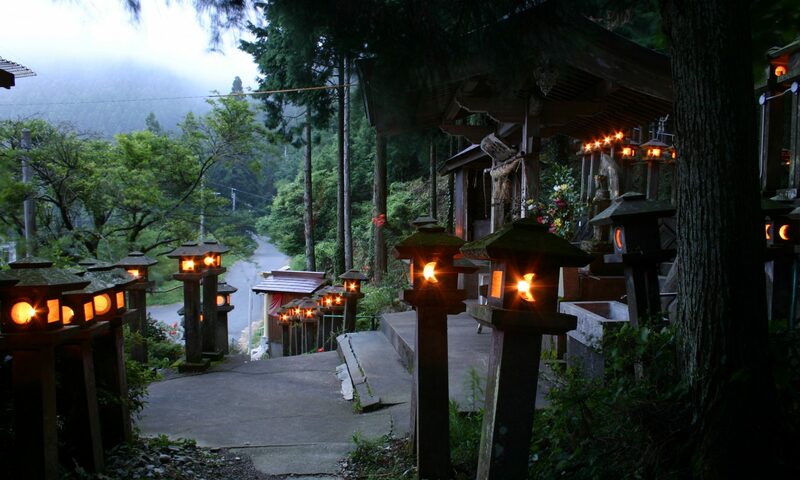 Remnant old growth forest can be found here and there, usually in the immediate vicinity of temples or shrines, occasionally along river courses or streams, and on the very topmost parts of mountain ridges. It is here that one finds Kyushu’s remaining populations of unusual plants. Japan is famous for its “happy Monday” holidays and one falls right around my birthday every July, umi-no-hi (directly translating as “sea day” or “marine day”), a tribute to Japan’s rich seas. My wife got the idea to get up early and go to a small river in a little valley just north of the city. She had gone there the previous week on a class trip with her children (she’s a preschool teacher) and had found a really odd looking fungus that I’d not seen before. Based on her description and memory, I figured it to be some kind of stinkhorn mushroom. A quick search on the web and I found the likely candidate, Clathrus archeri, the octopus stinkhorn. I’d seen stinkhorns before, but nothing like this one. So we packed up the car with camp chairs, photo equipment, and fresh coffee and biscotti for a morning picnic. This lovely clump of Neofinetia falcata is growing about 10 meters above a small river in a large ginkgo tree, Hisayama Town, Fukuoka Prefecture, Kyushu, Japan. We quickly found a nice spot in the shade along a curve of the river. Toes in the cool water, sitting comfortably in our chairs, sipping coffee and gnashing on biscotti… can life get much better? After a while I got the cameras ready to get photos and video of the fungus. I found them quickly and realized they were indeed C. archeri, a stinkhorn native to Australia and Tasmania that has now naturalized over much of the northern hemisphere. After some intense photography I returned to the river. Yumi was sitting and enjoying the river, watching an older gentleman play with his dog in the rapids. Then she went for a stroll of her own. 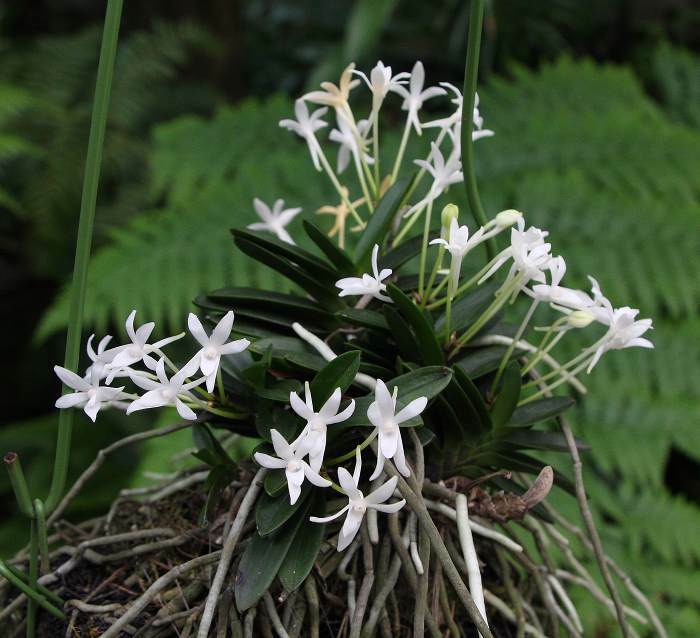 The end of the rainy season here in Kyushu, Japan usually falls on the first or second week of July, and also marks the peak flower season for one of Japan’s most celebrated orchids, Neofinetia falcata. I grow both wild forms, known as fuuran (often misrepresented as furan) and the selected varieties called fuukiran (again, usually called fukiran). Luckily, they require little assistance from me since I don’t repot as much as I should, letting nature do most of the work. Still, each year they grace my garden with lovely flowers. Here is a sample from this year. ‘Benisuzume’ – the cute little pink flowered form. I’ve been growing this plant for 10 years now. Flower count is just so-so, but still a nice display. ‘Tamakongou’ – this little guy was planted on a tree fern “swing” a few years back. It is doing fairly well and with time it should get pretty huge. Nice flowering this year despite any significant care on my part. ‘Seikai’ – I’ve grown this clump for around 8 years now – slow growing variety, but then again most Neos aren’t what you’d call “fast”. Two flower stalks this year made it to flowering. A must have for the Neo collector.